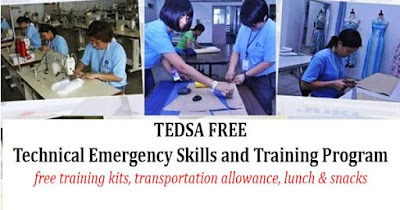 Technical Education and Skills Development Authority (TESDA) started their Technical Emergency Skills and Training Program which aims to give training to whoever people whose interest are in the field of working and business. This program mainly focuses on the Overseas Filipino Workers (OFWs), relatives of policemen and soldiers who died in the field of their service, relatives of traffic enforcers of Metropolitan Manila Development Authority (MMDA), surrendered drug users and informal settlers. Courses offered are motorcycle/small engine servicing; prepare cold meals; solar lamps assembly;nihonggo language; hilot (wellness massage); carpentry; process food bysalting, curing and smoking at maintain and repair audio/video products. Upon taking this program, the best part of it is that the tuition fee is absolutely free . Along with this are free training kits, transportation allowance, lunch & snacks for those who participated. According to Presidential Spokesperson, Ernesto Abella, this program answers the platforms of President Rodrigo Duterte which supports the OFWs to go back in the Philippines to start a new living after going abroad. At present, there are more than 2000 trainees in the whole country. They are honed with knowledge and skills which could give them necessary occupations in the near future.